Over the last 3.5 years, I've never really stopped freelancing, but at times have juggled it with consultancies and other large time commitments. Until recently, I was working 40 hours a week, balancing ongoing freelance projects, and trying to write papers for my master's program. So now that I'm "just" back to freelancing and grad school, it's easy for this to feel like either A) an extended vacation, or B) a depressing rut. But whether being in business for yourself is the goal, or if it's a transitional period, these are my favorite ways to not fall behind (even when you don't have immediate deadlines). Working from home has all kinds of perks, but I am also the kind of person who, knowing I have a video project to edit, will also think, "I have to vacuum and tidy the entire house first - I can't work in this chaos." And then the entire day is gone. 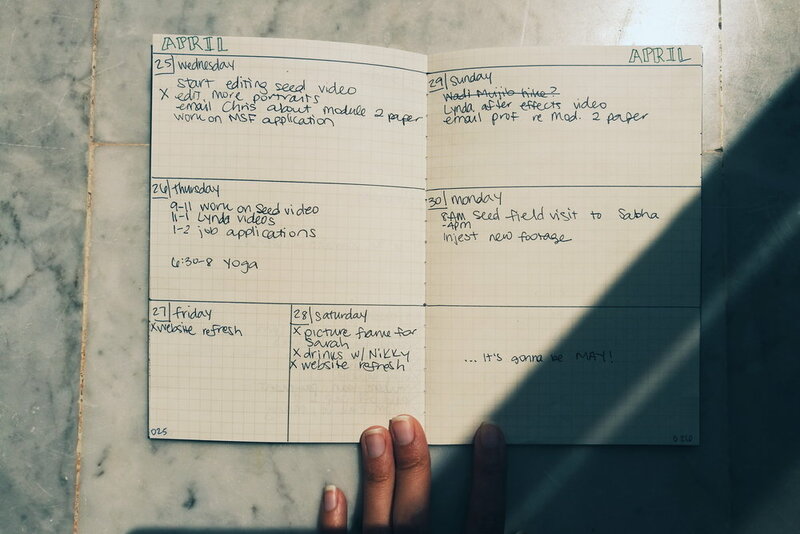 If I write down the things I want to take care of that day, I'm more likely to stick to it. But it's also worth knowing that trying to schedule out too many things can also throw you off. For example, between editing video or photo projects, writing proposals, catching up on admin work, learning new skills, and working on grad school, that could easily be a 12 hour work day. Sometimes it's better to devote yourself to one task for a day. And remember to give yourself plenty of sunshine and water. Luckily, I sometimes get to break up my routine with out-of-town field visits, but sometimes this means rotating between my desk at home and different coffee shops, which can get old when you just don't want to drink any more lattes. But you can switch it up by going to the library (at least it will likely be quiet), finding a co-working space, or making a work date with another friend who works remotely/from home - that way you don't accidentally go months without talking to people. This might mean dedicating a couple of days to getting your finances organized. Or organizing all those files you named FINAL_FINAL_FINAL_3.mp4. In my case, it meant working with another visual professional to edit my portfolio, revamp my website, and make sure I'm marketing myself the right way. We all need a second pair of eyes to judge our work (more on this later), and little details can make a big difference. This back-end kind of work can be time consuming and not fun, but it's important to do get it done. I hate the term "passion project," but it's true that most of us have some sort of project we always wanted to do, and it's also true that downtime in which to do it doesn't come very often. And sometimes, these projects can reignite your creativity if you're feeling stuck - working outside your normal format, or on a different subject matter, can make you remember why you fell in love with a place, or remind you why you wanted to be a photographer or filmmaker in the first place. Sometimes, you manage to learn on the job, and that's great; for a while, it felt like every video shoot I did was more complicated than the last - but that also meant I was learning new ways to do things. But, when you're looking at work you want to do, you might realize - oh, I don't know After Effects. Or maybe you've always wanted to learn InDesign, or finally make your own logo in Illustrator. 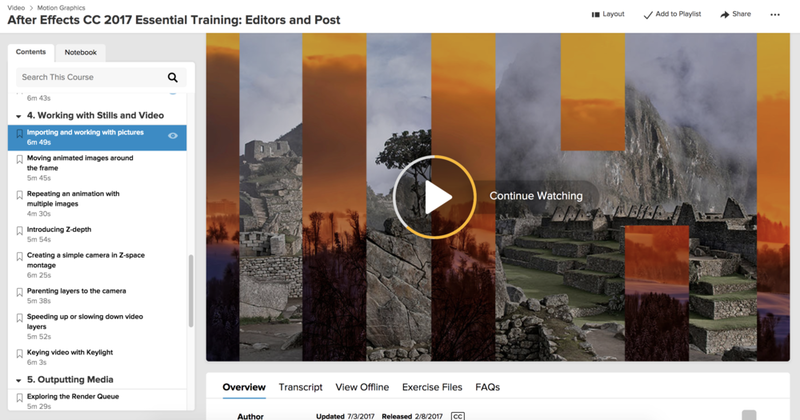 I pretty much learned how to use Premiere by watching teenagers' tutorials on YouTube when I couldn't figure something out, but Lynda.com is also well worth the subscription fees. If you can put in an hour a day watching a few videos and then practicing on your own - either with their practice files or on your own projects - you'll have developed a new skillset in no time.